"Is there anything more iconic of the lush tropics than the coconut? The delicious heart of this island treasure has a nutty, toffee flavor and aroma that sends you straight to the beaches of Paradise. Kick back with a Koko Brown, brewed with real toasted coconut, and savor the mahogany color and smooth, roasty malt taste. - Pours a clear and dark cola/tea brown with about a finger of white foamy head which has settled to a very thin layer above the brew, and a slightly bubbly ring on the edges of the glass. Overall not a bad looking beer. - Smells like a wonderful bready grainy brown. Subtle sweet notes with some nice yeasty bread. Light brown sugar and coconut sweetness. Overall the smell is good. - Nice beer. 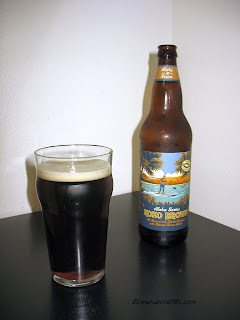 Balanced, lightly sweet brown sugar and malt, nice light roasted coconut flavors, just the right grassy bittering hops and a fantastic fresh and smooth finish. A very solid brew. - Light to medium bodied brew, well carbonated with tiny bubbles, and is just a touch chewy and cloying.. but still thin and sessionable. Easy to drink. 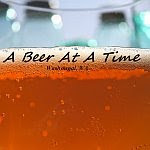 - This is a tasty hit of a beer, and one I am sure to buy again. It's taste is its best trait, and it is very balanced and good. 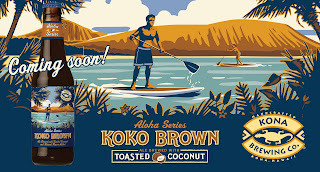 I was expecting a mediocre brown like so many, but was pleasantly surprised with the light sweet coconut flavors, and the perfect use of hops in this beer. Go try it!